Awhile back, a friend mentioned her husband and her were going to try to get tickets for Cirque Du Soleil when it came through town. It was something David and I had talked several times about going to, but tickets always seemed out of our price range. She mentioned they got really good deals through Goldstar and were hoping to get a good deal again, so I told her let me know if she found one and we'd be interested. Sure enough, she called last week and said they had a great deal going on. So, we decided to eat ramon noodles all week (just kidding) and go for it. After roping Amy into keeping my kid for a second time this week, we set off last night for our first Cirque Du Soleil experience. 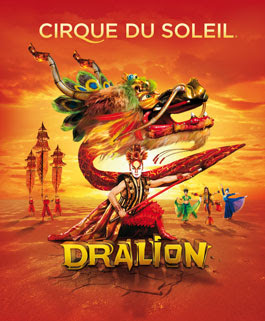 The one thing I've always heard about any Cirque Du Soleil show is that you either love it, or hate it. Evidently, I'm closer to the later. I cannot say that I completely hated it and that it was a waste of money, but I honestly cannot say that I thought it was the greatest thing I've ever seen. David however loved it. He thought it was awesome. His opinion is that I was warped from Nicole's opinion of it and had already went into the show with the mind set that I wasn't going to like it. I told him that I didn't think that was necessarily true....its just that Nicole and I have very similar personalities and we have the same odd likes and dislikes, so I'm thinking that's why I felt about it the way I did, not necessarily what she told me about it. I thought the theatrical aspect of it was as beautiful as everyone says it is. I loved the lights, the music, the costumes. They all were truly spectacular, but as I was sitting there, I kept thinking it wasn't as impressive as people make it out to be. I was waiting to have my life changed from it the way people talk about it. Maybe I just have really high expectations nowadays? I guess I was just expecting much more. Also, the main entertainment of the show was the clowns and they had a very slapstick comedy routine, and that's just not my cup of tea. On the way home, David and I were talking about it and I told him that as I was sitting there watching them, I was telling myself in my head "that's funny" but it wasn't funny enough to make me laugh out loud. David thought it was hilarious. Maybe its a guy thing? Would I go again? I told David yes, I would go see a different show. Would I recommend it? Yes, I think its something everyone has to see for themselves to decide if they love it or not. However, its not as life changing as I expected it to be. Anyone else seen it? How did you like it? For my birthday a few weeks ago, David surprised me with tickets to Wicked when it comes into town at the end of September. I am super excited about it, because I've heard nothing but good things about it. For some reason, I already feel certain I'm going to love it! AHH ..SNATCHING CAMERAS..i wouldn't have took mine either! lol..i think it would be interesting to see!